How accurate is the Body Mass Index? Mine is on the very highest edge of the “normal” spectrum, but just from looking at myself I can tell that I am not close to being overweight. Body Mass Index (BMI) is a popularly used calculation based on height and weight that provides an estimate for an individual’s percentage of body fat. If interested, you can easily calculate your BMI online. Although BMI is usually accurate, it has its drawbacks. The main one? Height and weight alone leave out important information. As the accompanying illustration (property of HowStuffWorks.com) shows, a muscular athlete may have the same BMI as a sedentary individual with a high amount of adipose tissue. While both may classify as overweight according to BMI, the sedentary individual is at a much higher risk for developing certain diseases (including heart disease and cancer) than the muscular athlete. This is why, except in the case of high obesity, most nutrition professionals like to compound BMI calculation with waist circumference measurements. 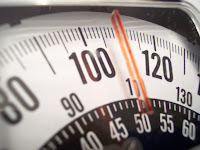 Scientific research has found an undeniable link between waist circumference and disease risk. In women, waist circumference of 30 inches or less is deemed healthy. 31 – 35 inches points to an increased disease risk, while measurements over 35 point to high disease risk. In the case of men, waist circumference should be at 36 inches or below. Measurements between 37 and 40 inches indicate increase disease risk. Any values over 40 indicate high disease risk. For example, a muscular male athlete may have a BMI of 28 (considered ‘overweight’) but a waist circumference of 32. The world renowned Framingham study concluded that a 2 point decrease in BMI reduces the risk of developing osteoarthritis (a loss of cartilage) in the knee by approximately 50 percent. 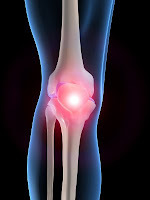 According to World Health Organization statistics, osteoarthritis is the fourth leading cause of disability in the world. The research literature clearly identifies obesity as the most influential factor in the development — and subsequent progression — of this condition. 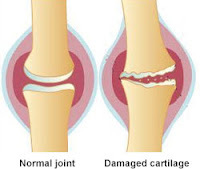 One of the more problematic aspects of osteoarthritis is that it makes implementation of most sorts of physical activity and movement significantly challenging, thereby adding more difficulty to weight loss efforts. The world renowned Framingham study concluded that a 2 point decrease in BMI reduced the risk of developing osteoarthritis (a loss of cartilage) in the knee by approximately ______ percent. The latest Small Bites survey reveals that 90% of respondents eat breakfast every day, 8% do so occassionally, and 1% never do. Although it is pretty much an established fact that breakfast-skipping children’s cognitive thinking is inferior to that of their classmates who eat prior to the beginning of the school day, dietitians don’t all agree on the importance of this meal for the 18 and over crowd. I plant myself in the “eating breakfast every day is a good thing” camp. No, scratch that — eating a healthy breakfast every day is a good thing. One advantage to eating breakfast is that it is the easiest meal to make high in fiber. Consider the options: high-fiber/whole-grain/low-sugar cereals, oatmeal, whole or sprouted grain toast, fruit-walnut-ground flaxseed parfaits, whole grain waffles, and more! Breakfast is also a great opportunity to get a good deal of calcium, whether it’s milk (dairy or soy) in your latte or cereal, or simply enjoying a bowl of yogurt (again, dairy or soy both do the trick). Many people think skipping breakfast is a smart calorie-cutting strategy. Wrong. Insert Family Feud “your answer is not on the board” buzzer sound HERE. Here’s the problem. Say you wake up at 7 AM and decide to cut calories by going straight to work with nothing but a Diet Snapple in your belly. By the time lunchtime rolls around, you will very likely be ravenous. Not surprisingly, we do not make the smartest nutrition choices when we have to eat. RIGHT. NOW. This being said, breakfast is not the magic bullet. Chomping down on two Pop-Tarts every day, or sipping a Venti caramel Frappuccino, does not constitute a nutritious breakfast. It simply adds extra empty calories… who wants those? Similarly, starting your day with a caloric overload — think a 740 calorie Wendy’s breakfast burrito — is certainly not setting you on the right track for the rest of the day. Do you really want half of your recommended maxium sodium intake before noon? But what about the studies showing that breakfast eaters have lower BMIs? 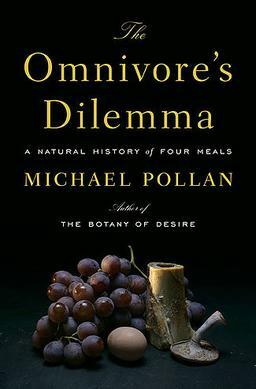 They make some interesting connections, although I can’t help but wonder if this is a case of those who eat breakfast every day simply being more health conscious and, therefore, keeping a more careful eye on their food consumption in general (thereby managing their weight better). According to 2006 figures released by food service juggernaut Aramark, the average adult in the United States has a Body Mass Index of 29. (Note: A healthy BMI ranges from 18.5 to 25. 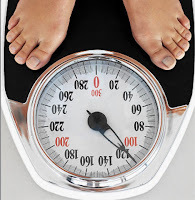 ‘Overweight’ is characterized as 25 – 30, and obese is marked by a BMI of 30 or more). As I have mentioned in the past, BMI (essentially a weight: height ratio) is not the most accurate measurement of weight status when dealing with individuals. One limitation to this formula is that it does not differentiate between muscle and fat. Therefore, a bodybuilder will misleadingly have a BMI in the “obese” category. When looking at large populations, though, I find BMI to be an accurate barometer, particularly when we are talking about the average adult in this country being on the verge of clinical obesity. It is also worth pointing out that there is a clear upward trend. According to the Centers for Disease Control and Prevention, the average adult in the United States had a BMI of 25 in 1960. I very, very highly doubt that the latest figure of 29 is due to more muscle mass, especially since this perfectly corelates to the increasing amount of calories consumed per capita in the past forty years. According to 2006 figures released by food service juggernaut Aramark, the average adult in the United States has a Body Mass Index of _____. Leave your guess in the “comments” section and come back on Thursday for the answer! In The News: Overweight = Healthy? Want to create a web of confusion and misunderstandings? Allow the media to report on a controversial scientific study, sit back, and enjoy the ensuing hijinks. Today’s New York Times reports on a study published today in the Journal of the American Medical Association which concluded that overweight people have lower death rates than their obese, “normal weight”, and underweight counterparts. “Some who studied the relation between weight and health said the nation might want to reconsider what are ideal weights,” reads one excerpt. Many media outlets are giving this a rather troubling spin, rhetorically asking if people should worry about losing those extra five or ten pounds. I have several concerns with this study. Firstly, the study used body-mass index rates to determine what category participants fell into. For those of you who aren’t familiar with it, BMI is a number acquired by inputting your weight and height into a formula. A BMI between 25 and 29.9, for instance, is considered “overweight”. One very limiting factor of this calculation is that fat and muscle mass are seen as equals. So, a sedentary 5’7″ male with little muscle tone weighing 180 pounds has the same BMI as a muscular, athletic male of the same height and weight. However, these two men have very different health profiles. The sedentary male has a higher risk of developing diabetes, high blood pressure, and atherosclerosis than his muscular counterpart. For all we know, the “overweight” people (with high BMIs) in this study were athletic people with high muscle mass levels. Additionally, I hope it is not news to anyone that being underweight is not healthy. Falling below your ideal weight compromises your immune system, raises your risk of osteoporosis, and is linked to low consumption of vital nutrients. Lastly, this article exemplifies why it is problematic to equate our weight with our health. There are many people who do not consume excessive calories (and, therefore, do not gain weight), but do not make nutritious choices. It is certainly possible for someone to fall into the “normal weight” category while shunning fruits, vegetables, and whole grain and not gain weight. Meanwhile, an athletic person with healthy eating patterns can be considered “overweight”. Let’s not complicate matters further. If you are sedentary, ten pounds overweight and eat mostly processed foods, do not kid yourself into believing that you are healthier than your friend who eats healthy and is at a “normal weight”. Extreme circumstances not withstanding, the WAY you eat is more important than what you WEIGH. Instead of obsessing over the scale, eat close to nature, limit processed foods, include a variety of fruits and vegetables in your diet, make most of your grains whole, and pay attention to portion sizes.